You can use the developer console to create and publish private skills. A private skill is published live, but is not available in the Alexa skill store. A private skill is different from a skill that is in a beta test with a set of selected customers. Open the skill in the developer console. Navigate to the Distribution page. Make sure you have completed all fields in the Skill Preview section for each language. In the left-hand navigation, click Availability. For the availability option, select Alexa for Business Organizations, then click Save and continue. Navigate to the Certification page. Review and correct any validation errors. All validations must pass before you can submit the skill. Click Submission, then click Submit for review. When you publish a skill privately, its status changes to Live in the developer portal. Expect the process to take approximately 20 minutes. 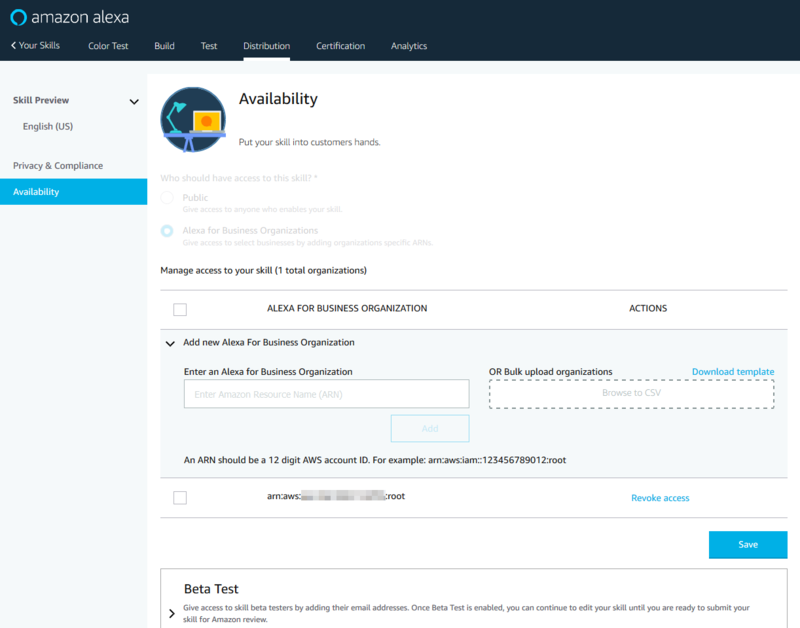 You can manage the Alexa for Business organizations with access to your private skill from the Distribution > Availability section of the developer console. The Manage access to your skill section contains controls to add and remove organizations. The list of organizations that currently have access are displayed as well. Once the skill is distributed from the developer console to an Alexa for Business organization, the skill can be accepted by the Alexa for Business administrator, enabled on shared devices or made available for enrolled users to discover in their companion app. For more details, see Managing Skills. Important: You cannot access the options to manage the account list until the skill has moved from certification to live (which can take up to a few hours after submission). Open your list of skills in the developer console and note the Status column. A live, private skill also has a Manage Access link in the Actions column. When you add Alexa for Business organizations, you provide the AWS account ID in the exact ARN format: arn:aws:iam::<account ID>:root. For example, if the AWS account ID is 123456789012, you would provide: arn:aws:iam::123456789012:root. You must specify the root and not an individual user for that account. You can add an account to the private distribution account list for the specified private skill. This means the specified account will be granted access to the skill. Open your list of skills in the developer console. Click the Manage Access link in the Actions column. Alternatively, you can click View to open the skill, then navigate to Launch > Availability. Under Manage access to your skill, enter the account ID to add in the edit box and click Add, then click Save. The account ID should be in the form of arn:aws:iam::123456789012:root, where 123456789012 is a placeholder for an AWS account Id. You can delete an account from the private distribution account list. This means the account's access to the private skill will be revoked. Under Manage access to your skill, click the Revoke access link next to the account to remove.